Traackr's Funnel Report lets you track relationship progress—from awareness to advocacy—and monitor your influencer funnel conversion. You can see exactly how the shape of your funnel is changing and watch how your influencer relationships progress over time. At what rhythm is your influencer funnel growing over time? Are influencers progressing through the stages of the relationship? Do you have a steady process to move influencers down the funnel? How do individual team members (relationship owners) contribute to success? This visibility helps your team understand the progress you’re making in turning influencers into advocates for your brand. How can I create a new funnel report? You can create a new funnel report for any group of influencers in your account. To create a new funnel report, go to the Analytics tab, click on the "Create Report" button, and select Funnel Report from the menu. How can I see my funnel status? The Funnel view gives you a quick snapshot of your relationship funnel by measuring the total number of influencers in each stage across your influencer network. You can select any relationship stage to see all corresponding influencers. Can I see influencer movement between stages? 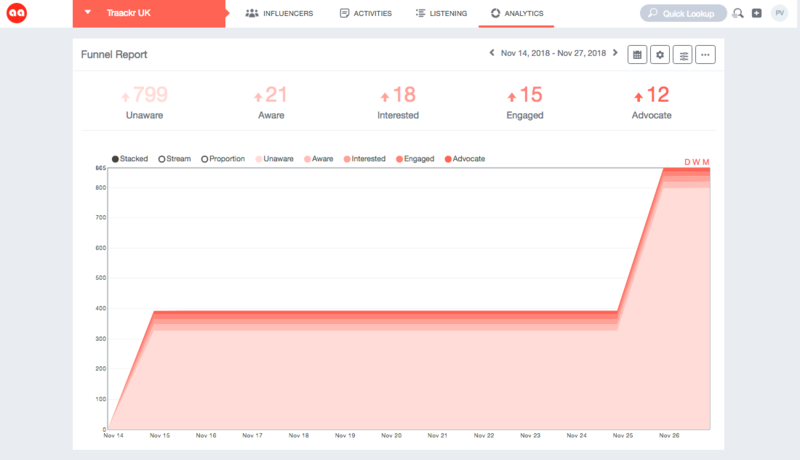 The Funnel History view helps you track the progress of your influencer relationships over time and measure the results. You can see the movement of influencers from the beginning to end of the designated time frame. You can click on any segment to see the corresponding influencers. Traackr provides several ways to filter your funnel report data by group of influencers, clicking on the gear icon in the top right. For example, you can see how individual team members are contributing to success, simply by filtering the data based on relationship owners. With this information at hand, you can set goals for your team and keep everyone motivated and focused on the end goal. Funnel conversion data is not currently available for export.